Remember that time I covered a clearance grocery store cake with edible flowers? And how I mentioned that I wanted to find a couple of other ways to put those flowers to use? Well, this post is the first of two extra crafts that I came up with to make those pretty blooms last. And since it’s a Friday morning, I’m going to keep this short and sweet. The goal? To create simple flower-embellished wine bottle labels fit for your next gathering. The first step in this process is to dry a handful of blooms. Grab a heavy hardback book, like a nearby coffee table book or encyclopedia, and open it up to a random page toward the back. 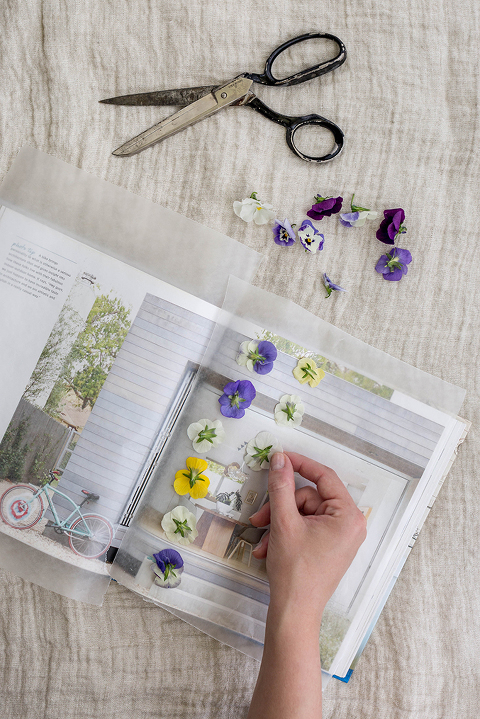 Lay wax paper on either page of the open book, and then place the blooms face-down on one of the pieces of wax paper. 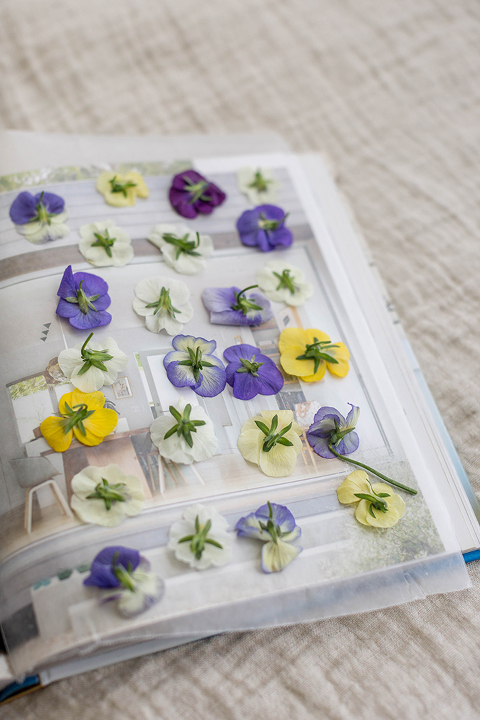 Lay the opposite piece of wax paper on top of the flowers, and gently shut the book over the blooms. 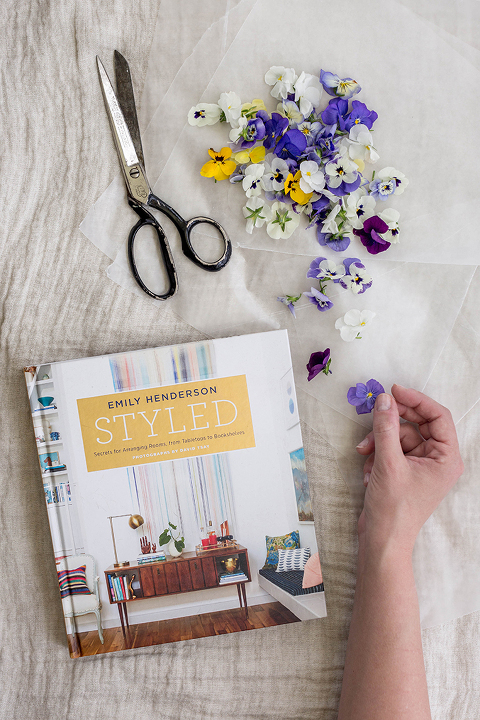 Place the book in a cool dry place (just put it back on the coffee table or bookshelf), and allow the flowers to dry for at least a week in the closed book. After a week’s time, download one (or both!) 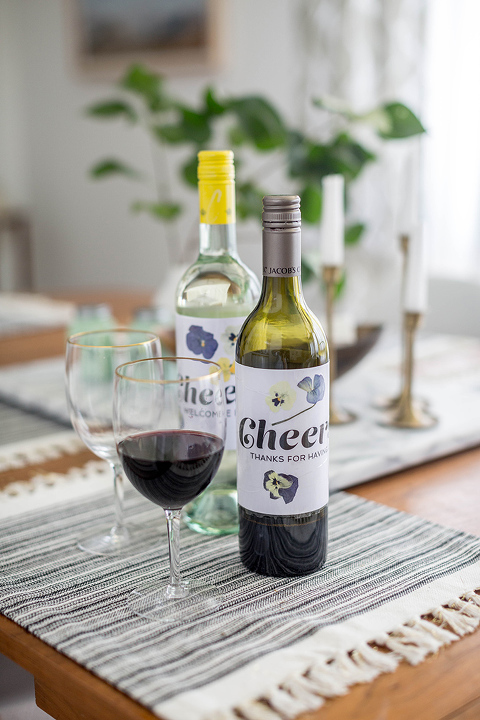 of the free printable wine bottle labels I created—“Welcome Home” (for a housewarming gift) or “Thanks For Having Us” (for a hostess gift) —depending on your needs, and print them onto heavy cardstock paper. Use a ruler to figure out how big your label needs to be in order to cover the wine bottle’s original label, and trace light lines onto the cardstock using a pencil. Cut the label out, and lay it across your wine bottle so that it covers the old label. Now it’s time to retrieve your dried flowers. Grab the book they’re drying in, and choose a few favorites. They should easily peel off of the wax paper if you do so slowly. Gently lay them on the label to test different arrangements, and when satisfied, attach them to the paper using a small dot of tacky glue. Finish by using clear packaging tape to firmly attach the flower-embellished label to the wine bottle. Although this project requires a bit of preparation and hands-off time to complete while you wait on the dried flowers, the label prep and finishing phase take just 20 minutes or so. Stay tuned later this month for the third and final DIY flowers project—I think it’s my favorite of the bunch.